Greetings from São Paulo to all Earth activists! I’m glad to announce that the applicant group to became the first Faircoop Local Node in our city had met in presence for the second time last July 9th, a monday and city holiday. 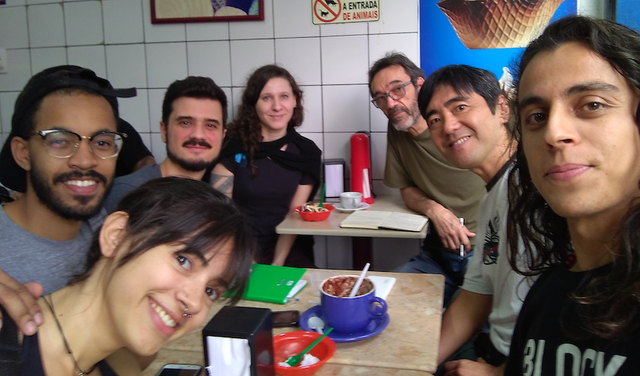 Different from the first meeting, also recorded here in Steem blockchain in the post Announcing the group application to become the first Faircoop local node in São Paulo, Brazil, this time, beyond the 3 initial members - Marcos (@vikdias), Pedro (@parrachia) and I (@wagnertamanaha) - we also have the participation of Maíra (@mairadasneves), Jerome, Juliana and Guilherme. From left to right: Juliana, Guilherme, Jerome, Maíra, Marcos, Wagner and Pedro. Picture available on Flickr. After introducing ourselves - Maíra is a visual artist and translator, Jerome works in a permaculture project with Casa Brasil, Juliana is a computer systems analyst and Guilherme is a marketing student at university - we talked about the Faircoop and Faircoin and the possibility to start the Local Node in São Paulo. Guided by the page How to create local nodes we decided to define some priorities, detailing the critical items (described below) with proposals about how we continue working from now. Welcome to FairCoop at local level. Making possible to host physical meetups with individuals and collectives interested in FairCoop. We’ve been thinking in two options that could run in parallel, not excluding each other. The first option would be deciding some rules, methodology and minimum requirements to organize events and meetings in public or commercial spaces (somewhat like we’ve done in our first 2 meetings). Temporary and nomad occupations of the city available spaces. 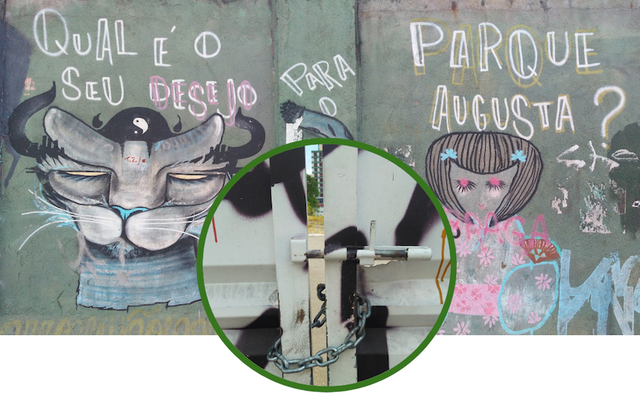 The other option would be finding a space in a fixed address, inviting its managers to became a partner or join the Faircoop Local Node São Paulo. Connection between the FairCoop network and local projects. LNs are the best for knowing which projects in their region could be interested in Faircoop, and is responsible to contact them. There is also the need to facilitate and support the use of all the different economic tools available in the FairCoop ecosystem. We will start mapping the initiatives, people and projects in São Paulo, Brazil. Like we did in our first 2 meetings, we want to expand these visits, selecting other city spaces, groups, collectives and activists. Main team of a Faircoop project or task. Have a team that is able to work together physically, becoming more powerful than just a virtual team. Be a local node that accepts the responsability for coordinating a FairCoop project or a concrete global task. We will work to strength the group that already gathered and met in presence and also expand the invitation to more people to join us. To the next meetings and events we expect to bring more participants and attendees. Beyond these topics we want to focus first we also talked about the eventual necessity of being integrated to Fairmarket, offering services and products accepting Faircoins. Start convincing shops and professionals or even thinking in generate revenues to fund the local node maintenance and expenses. We decided that these steps could be done after consolidating and growing our group. Other questions about the internal organization were decided: migrating our contact and collaborative online channels from proprietary services (Slack, Gdrive) to the Faircoop recommended ones in https://fairapps.net and starting a study group about Faircoop and Faircoin. A organized tour to the Ubatuba Local Node was mentioned, we would talk with Marcelo (@marcelovoos) as soon as this proposal go further. Pictures available on Flickr: 1, 2, 3 e 4. Fortunately all our talk and discussion happened with a lot of ice cream and açaí. I heard from Mr. Soroko, the shop owner, that thanks for the patient and teaching from an old vegan customer they are the pioneers in our city for prepare and sell ice cream with soy milk, without any animal ingredient. The açaí (amazon berry), if I’m not mistaken, is still done direct shaking the frozen berries and not from industrialized mixed base used in most other places in São Paulo. Pictures available on Flickr: 1, 2 e 3. The ice cream shop is located in the well know Augusta street, in front of the land (a big green area with rare species like araucária trees) where construction companies and neighbors were disputing if would be or not the future Parque Augusta (Augusta Park). Mr. Soroko even help the Park Augusta supporters giving place in his shop to their campaign events and shows. There also were a picnic over the asphalt, when they authorized closed the block to cars and call attention for their fight. Thank you very much! We invite you to know more about Faircoop and Faircoin. Join us in this autonomous movement and come building the Earth cooperative, working in a post-capitalist model, fair and sustainable. If you are living in São Paulo, join our applicant group to became the first Faircoop Local Node in town. Just reply this post, join the Faircoop em Português Telegram group or ask to have access to the Nodo Local São Paulo Fairchat channel. Long live to autonomous cooperativism by consensus! Thanks and good luck again! Original post in portuguese: Dia 9 de julho, feriado na cidade, aconteceu a segunda reunião do grupo candidato para o nodo local da Faircoop em São Paulo/SP. 3/29/2018 - My neighbour's roof garden. Downtown São Paulo city, Brazil.